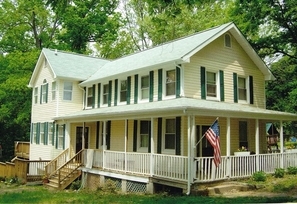 This residence is located in Historic Relay. MD in Baltimore County. The project consisted of a 2-story addition, which included an expanded eat-in kitchen, a porch extension with a new entrance and mudroom space, and relocated powder room on the first floor. The second floor included a new master bedroom suite and guest bathroom. Additional work included the addition of central HVAC and the construction of a new 2-car detached garage at the rear of the property. J-Squared Architect's scope of work included the design, construction documents, permitting, and construction administration. Historic District submittal and approval was a part of the overall process.